Full length native protein (purified). The immunogen was purified beta-galactosidase from Escherichia coli. Antibodies were solid phase absorbed then immunoaffinity purified using purified beta-galactosidase immobilized on a solid phase. 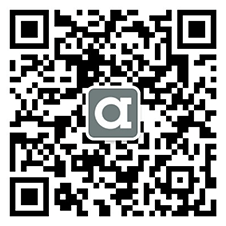 Our Abpromise guarantee covers the use of ab9361 in the following tested applications. 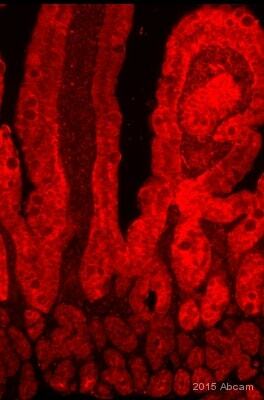 ab37382 - Chicken polyclonal IgY, is suitable for use as an isotype control with this antibody. WB Use a concentration of 0.5 µg/ml. Predicted molecular weight: 116 kDa. IHC-P 1/200 - 1/2000. Perform heat mediated antigen retrieval with Tris/EDTA buffer pH 9.0 before commencing with IHC staining protocol. Beta galactosidase is coded by a gene (lac z) in the lac operon of Escherichia coli. It is a metalloenzyme that splits lactose into glucose and galactose. It hydrolyzes terminal, non-reducing beta-D-galactose residues in beta-D-galactosides. Activation by cations seems to be substrate dependent. K+, Na+, NH4+, Rb+, Cs+ and Mn++ all activate enzyme activity based upon the substrate used. P0-adult mice were euthanized and perfused with 4% paraformaldehyde in PBS (PF). Their spinal cords were then post-fixed for 30–60 mins in 4% PF at 4°C (P0) or at room temperature (adult). Spinal cords were rinsed and cryoprotected in 20% sucrose in PBS (4°C) prior to embedding in OCT (Tissue-Tek). Immunostaining of frozen spinal sections was performed by incubating 20 µm thick sections with primary antibodies, which were then detected using species-specific secondary antibodies conjugated with Cy2, Cy3 and Cy5 or FITC. ab9361 was used at 1:1000.
ab9361 staining beta Galactosidase in mouse e13 stomach and liver tissue sections by Immunohistochemistry (IHC-P - paraformaldehyde-fixed, paraffin-embedded sections). Tissue was fixed with Davidson's fixative, permeabilized with 0.5% Triton-X 100 and blocked with 10% serum for 30 minutes at 22°C; antigen retrieval was by heat mediation in a citrate buffer. Samples were incubated with primary antibody (1/500 in TBST + 10% goat serum) for 16 hours at 4°C. A Biotin-conjugated goat anti-chicken IgY polyclonal (1/500) was used as the secondary antibody. Immunocytochemistry/ Immunofluorescence - Anti-beta Galactosidase antibody (ab9361)Image courtesy of Dr Sean Speese by Abreview. ab9361 staining beta Galactosidase in fruit fly central nervous system glia cells by Immunocytochemistry/ Immunofluorescence. The cells were fixed in paraformaldehyde, permeabilised in 0.1% Triton. Samples were then incubated with primary antibody at 1/2000 for 12 hours at 4°C. The secondary antibody used was a donkey anti-chicken monoclonal conjugated to DyLight® 649 (pink) used at a 1/400 dilution. Nuclei stained with a pan nuclear marker (green). Ab9361 staining Beta galactosidase in Mouse thyroid tissue sections by Immunohistochemistry (PFA perfusion fixed frozen sections). Tissue samples were fixed 10% buffered formalin, cut into 3-4 micron slices, blocked with 10% normal goat serum and antigen retrieval was by heat mediation in citrate buffer. 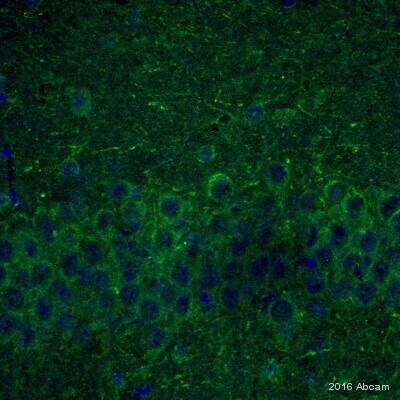 The sample was incubated with the following primary antibodies; anti-BrdU, anti-Sca1 (ab109211, 1∶600), anti-NKX2-1 and anti-β-gal (ab9361, 1∶1000). Sections were incubated with the first primary antibody (anti-Sca1) for 1 hour at room temperature. After washing with PBS, sections were incubated with the first secondary antibody (Alexa Fluor 555 goat anti-rabbit IgG) and washed with PBS. Sections were then incubated with normal serum (5% rabbit serum) from the same host species as the first primary antibodies for 1 hour at room temperature and washed with PBS. Sections were further incubated with an excess of unconjugated Fab antibody derived from the same host species as the primary antibody for 1 hour at room temperature and washed with PBS. The sections were finally incubated with the mixed second primary antibodies (anti-BrdU, anti-β-gal, anti-NKX2-1) overnight at 4°C, washed with PBS, and were incubated with the second secondary antibody (Alexa Fluor 488 goat anti-rat IgG, Dylight 650 goat anti-chicken IgY, Dylight 594 goat anti-rabbit IgG) for 1 hour at room temperature and washed with PBS. DAPI dye was used to stain the nuclei of cells. 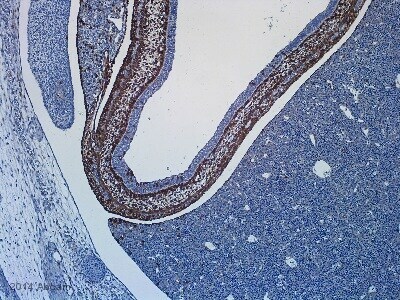 ab9361 staining Beta Galactosidase in mouse retinal tissue sections by IHC-Fr (Frozen sections). Tissue samples were fixed with formaldehyde, permeabilized with 0.2% triton-X and blocked with 5% serum for 1 hour at 23°C. The sample was incubated with primary antibody (1/1500 in PBS, 2% serum, 0.2% Triton-X) at 4°C for 16 hours. An Alexa Fluor®488-conjugated Goat monoclonal to chicken IgY (1/200) was used as secondary antibody. ab9361 at 1/250 staining human HEK293T cells by ICC/IF. The cell line was transfected with a b-gal expressing plasmid, and x-gal staining was performed on adjacent wells. The cells were paraformaldehyde fixed and blocked with serum prior to incubation with the antibody for 16 hours. 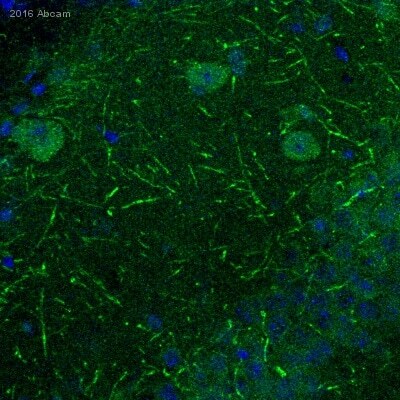 A Texas Red conjugated donkey anti-chicken antibody was used as the secondary.